The CDC is reporting that the first official case of Ebola in the U.S. has been diagnosed in a person who traveled to Dallas, Texas from West Africa. The infected person is in isolation at a Dallas hospital, and the CDC reports that it is getting in touch with people they were in close contact with to monitor them for symptoms of the illness as well. 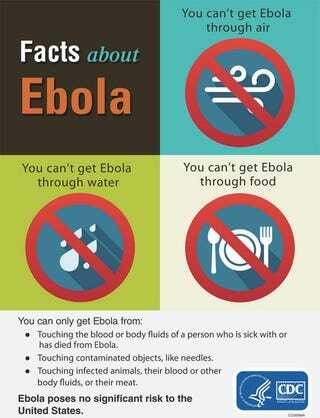 People who were on the plane with the Ebola patient are, according to the CDC, not in danger. The illness can only be communicated when a person has symptoms, and the infected person in Dallas did not exhibit symptoms until 5 days after they had gotten off the plane. The ill person did not exhibit symptoms of Ebola during the flights from West Africa and CDC does not recommend that people on the same commercial airline flights undergo monitoring, as Ebola is only contagious if the person is experiencing active symptoms. The person reported developing symptoms several days after the return flight. We know how to stop Ebola's further spread: thorough case finding, isolation of ill people, contacting people exposed to the ill person, and further isolation of contacts if they develop symptoms. The U.S. public health and medical systems have had prior experience with sporadic cases of diseases such as Ebola. In the past decade, the United States had 5 imported cases of Viral Hemorrhagic Fever (VHF) diseases similar to Ebola (1 Marburg, 4 Lassa). None resulted in any transmission in the United States. Ebola has a very short incubation period — 21 days at most — and is only communicable when patients are symptomatic. That means it's easy to spot and contain the virus quickly in places where patients have access to developed medical facilities.